Water is an essential element for all life; in the past it has been considered as a relatively abundant and cheap resource and as a result there are a number of inefficient practices that lead to significant waste. Furthermore, whenever water needs to be handled for transport or treatment, significant amounts of energy are involved. It is clear that water and energy are interlinked resources that must be optimized throughout the economy. There has been much debate regarding the use of water for oil and gas production in Canada with both government and industry concluding that many regions of Western Canada (particularly Northern Alberta) have ample freshwater supplies that can sustain a growing oil & gas industry without affecting the needs of other users. 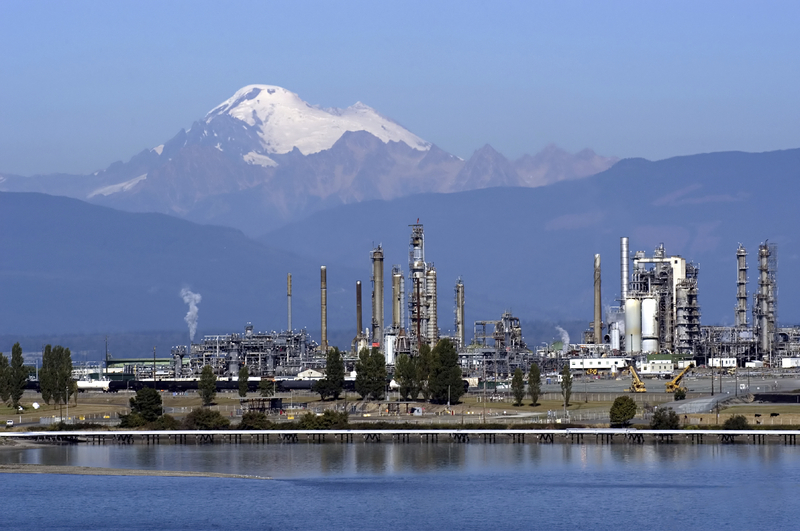 However and even if these conclusions are fully validated by scientific studies, global oil and gas companies would benefit significantly from developing water-efficient technologies that can both demonstrate good corporate responsibility and satisfy an increasing demand for solutions throughout a water-constrained world. PTAC has recognized the increasing importance of water management in the Oil & Gas sector and has organized a number of events and forums to exchange ideas about technology practices and regulations to address industry needs for water usage reduction, beneficial re-use, and reduced treatment cost options. The latest installment of the forum took place in Calgary, AB this past April 7, 2010 and this summary includes some updates on regulatory issues. Regulators in Alberta (ERCB and Alberta Environment) have introduced definitions of saline and non-saline water as well as the so-called Base of Groundwater Protection (BGWP), which is the approximate depth at which water turns saline. Activities above the BGWP are monitored very closely. The main ERCB directives were briefly reviewed as they relate to the use of certain drilling fluids, protection during completions and fracturing operations. ERCB Directive 44 requires operators to report volumes of produced water for all wells operating above the BGWP and that produce 5m3/month or more. The ERCB database indicates that approximately 35% of these wells are non-saline. The Directive describes requirements for surveillance, sampling and analysis of produced water.The reporting activities are designed to ensure no cross-flow of water between completion intervals, no mixing of groundwater of different salinities and to determine production volumes. 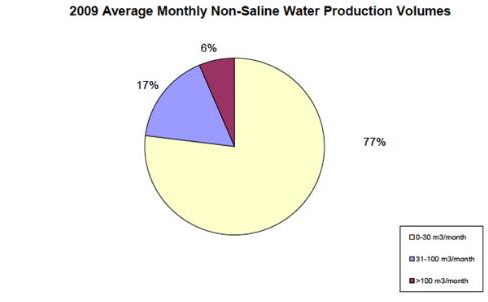 The ERCB reported on aggregate results from this surveillance activity, which shows a significant decrease in the number of wells producing large non-saline water volumes.The reports show that the goals are being achieved with no cross-flows issues detected.Surveillance data from 2007 also reveals that the largest proportion of wells producing non-saline water involved small-volume wells (0-30 m3/month) as illustrated in the following figure. Directive 44 has been successfully implemented and it enables the Alberta Government to track water volumes that are produced in the sector. It indicates that the objectives of groundwater protection are being fulfilled. This experience however should be expanded to consider the final disposal of these water volumes; technologies are available to treat both brackish and freshwater for reuse. As water allocations become more difficult due to population growth, agricultural requirements and larger cities the significance of these volumes will take on greater relevance. The topic of water increasingly raises tension between competing users; the complex interplay between industry, regulators, landowners and society at large reflects that decision-making regarding water resources will become more difficult in the near future. Operating companies will have to record and manage their water use much more closely than what the regulators currently demand and the resulting databases and information systems will become strategic assets to support decision-making. Regulatory requirements for water management and conservation are likely to become more and more stringent; industry should take a proactive approach in managing this precious resource and improve monitoring and targeting practices as well as work in identifying opportunities for reuse and recycle of the produced water before it is required by governmental agencies.